We love all kinds of quilts! 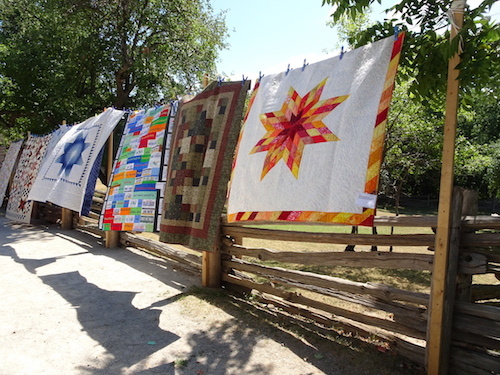 We have lots of space to display quilts at our show and they look pretty spectacular blowing in the breeze under a sunny sky. So don’t think your quilt is not good enough- it is! We need your application in by June 15th 2019… but earlier is better! If you haven’t sewn the binding on- but promise to get it done before the show- enter your quilts now! If you prefer, you can download a form here. and mail it in. When you submit an online application or download and mail it in, you will be mailed a quilt label to identify your quilt. Please attach it securely – sew it on, or use several safety pins. AND remember your quilt number(s). This will help speed up picking your quilt up after the show. Remember, we are looking for all kinds of quilts- from modern to traditional and anything in between. They do not need to be new quilts, as long as they are new to us. Got a quilt that has been in your family forever? Give it a breath of fresh air by hanging it at Quilts at the Creek this summer, it will look FABULOUS! Drop off and pick up of quilts must be at the same location. If you drop off your quilt at Black Creek Pioneer Village, for instance, you must pick them up there too. If you are sending someone else to pick up your quilts, please email Valerie vrprideaux@gmail.com with that person’s name. Drop off for Black Creek Pioneer Village is on Friday July 27th, 9 am to 11 am. We have a range of drop off points in and around Toronto. Quilts should be dropped off at one of these locations only between July 18-23rd. They will be ready for you to pick it up quilts after Quilts at the Creek 2019 on Wednesday July 31st 2019. Country Clothesline/Fabric Spark (East York) Check store openings, no open every day! Plus personal homes: if you select one of these, you will receive the exact address two weeks before the show via email. If you like a challenge, you can enter our quilt challenge for 2019: map your world. Interpret this as you wish- check out our monthly posts with some ideas! Yes, I can see your application. Thanks for participating! .. and I will try to see if I can set up an automatic response for next year. The deadline has been extended to the end of the June, so you can still submit it- but hurry! Time flies when you are having fun.. quilting! If you don’t mind it being folded over, we can work with that… can’t wait to see it!